Miranda Green » Exclusive: Time for a new Church Committee? Exclusive: Time for a new Church Committee? The famed whistleblower is petitioning Congress, he tells The Daily Beast’s Miranda Green. “I’m hoping that we will see public pressure successful in causing Congress to name a select committee investigating the potential full scale of surveillance by the whole intelligence community and proposing legislation that will reflect a full congressional investigation,” Ellsberg told The Daily Beast about a new petition he’s putting his name behind, calling for greater congressional oversight of the NSA and the intelligence community. 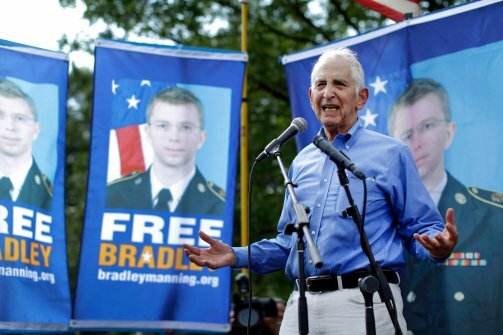 The petition is hosted by CREDO Action, an activist website that approached Ellsberg after hearing his remarks in recent weeks in defense of Private Bradley Manning, Julian Assange, and Edward Snowden. “Pressure by an informed public on Congress to form a select committee to investigate these revelations might lead us to bring NSA and the rest of the intelligence community under real supervision and restraint and restore the protections of the Bill of Rights,” Ellsberg writes in the petition. The committee would be similar to the one formed by Sen. Frank Church in 1975 after the Watergate scandal and Ellsberg’s release of the Pentagon Papers. During Ellsberg’s trial for releasing the classified documents, it came out that government agencies had been spying on him and tapping his phone through illegal means, which ultimately lead to his trial’s dismissal. The Church Committee began investigating illegal actions by the CIA, FBI, and NSA a few years later. Ellsberg says he understands Edward Snowden’s reasons for recently leaking information on the NSA’s Prism program because he has also been a victim of such wiretapping. Members in Congress have offered proposals to curb NSA access to Americans’ phone records since news of the program spread. So far four bills have been introduced by members in the Senate. The bill with the most support was co-sponsored by Sens. Jeff Merkley (D-Ore.) and Mike Lee (R-Utah) and would declassify FISA court opinions, making it public what organizations are being granted the right to certain surveillance. Those proposals are helpful, said Ellsberg, but no substitute for a committee empowered to look inside the secretive American intelligence community.